Finally I got my Sous Vide machine to compliment my Modernist Cuisine . Still I need some other stuff, but the current wife has to work harder to buy me my little gadgets... I don't work because I am an intellectual and an artist... she knows that. 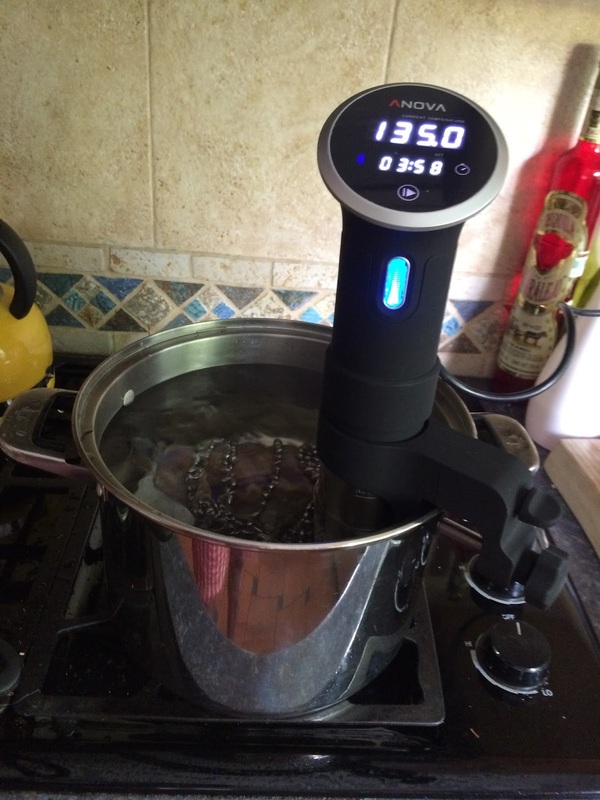 The one I got is an Anova Sous vide and it so easy to use and so fantastically advanced. I just unpacked it, plugged it, installed the app...and done. The app is required so you can access your machine at distance so you can control it. I was doing gardening, so the phone beeped when my food was ready. Nice! My first experiment was the Bourbon Glazed Tenderloin (the tenderloin was on sale...I couldn't resist) and as the current wife is in a "conference" in Kelowna -and also she is visiting the kid that we found in a forest after aliens had abducted him for experiments and that now we call him "son"... so I could cook to my liking. 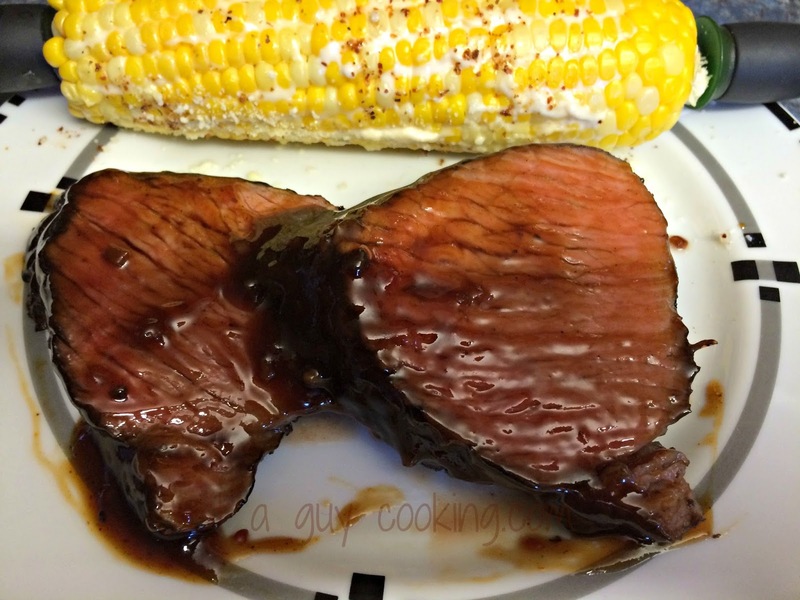 The recipe I got was from the Modernist Cooking Sous Vide book by Jason Logsdom... and aI did some changes to it based on my health limitations. The end result was fantastic. The experience was worth wile. The first thing I learned was that I could use a zip-log bag instead of the vacuum sealed bags -which I don't have but that you can gift me anytime...just don't wait until Christmas please-. I do have ziploc bags as the wife has some sort of obsession... she ziploc bags everything, including the cats (today they seem a bit blue but it might be the weather). She tried to ziploc me but I ran like crazy and started to cry. The tears worked just fine. 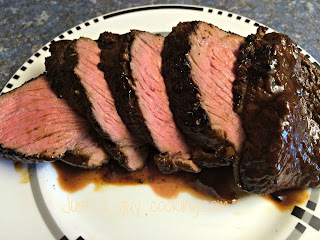 The second thing I learned was that the Sous Vide system works with two things: electricity and patience. If you are looking for a fast meal, I recommend the microwave oven. Oh, by the way... if you are the elderly fellow that claims to be my cousin and that only approves the recipes that were done by your great great grand mother.... sorry... this is not for you. Please burn your meat on an open fire. Be my guest. * The 6 hours include prep time…the actual cooking time is 45 minutes !!! 1. Mix the spices together in a bowl. Place the tenderloin and the spices mix on the Ziploc bag, mix until the whole tenderloin is covered and seal using the water immersion system to eliminate the air trapped inside the bag (basically it means that you submerge the semi-sealed bag in water -not allowing water to get in- and squeeze so all air is out, then just close the bag) . 2. Put the Ziploc bag in the fridge for about two hours so the spices aromatize the meat. 3. Preheat the water bath to 135°F / 57.2°C. Place the sous vide pouch in the water bath and cook for 3 to 6 hours… I like my meat pink so I gave it 4 hours. I used my Sous Vide ruler App that based on the meat thickness and weight gives you the cooking time. 4. Wait…and wait… imagine that you are using a slow cooker. Go and do some other stuff and your phone will tell you when the time is up. My Sous Vide machine has bluetooth capabilities so I used that. 5. Preheat the grill to high heat. 6. Prepare the glaze mix together all of the ingredients in a pot over medium-high heat and bring to a simmer, stirring occasionally. Cook for about 30 minutes, until it thickens some. And, YES…it uses a whole cup of bourbon… but the end result justifies it, believe me. 7. Take the pork out of the pouch and pat dry. Sear on the grill until grill marks form on the first side, a couple of minutes. Brush the glaze on the side facing up and turn the tenderloin. Repeat several times until it is coated with the glaze, cooking about 30 to 60 seconds per turn. Once a year the current wife likes to invite her "birdwatching" friends to have "tea". She thinks that I buy the "birdwatching" and the "tea" part...but I just let it slide. She always says that she will buy some chips and cookies from the supermarket and that that will do. Yeah, right! She knows that I won't allow that to happen so I offer my catering services to host her drinking friends...sorry..."birdwatching" friends. I wouldn't do this if I didn't like her friends, which I do and because I want to keep the marriage in a standby status...I don't make waves. This year I cooked some very tasty and different dishes: I cooked Mexican corn on a stick (big hit), Poblano, Cheese and Corn Ebelskivers, Red Tomato Empanadas - a dish from Monterrey, Mexico and a Cognac Drunken B.C. Cherries and Equatorial Dark Chocolate Tart. I have to say... I was happy with the end results. The "tea" party went well and the current wife's drinking friends...sorry....birdwatching friends were happy. Some even took some leftovers for their houses. I love when the food is all gone and the food is appreciated. It was great. The recipes for all the other dishes eventually will make the blog, promise, but for now I'm just sharing my Red Tomato Marmalade (and...please all those British readers.... I know that you all call only "marmalade" if its made of citrus.... but this is actually called Marmalade...so call the Queen). To prepare the Tomato Empanadas I had to cook first my marmalade, which took me a day and a half. It was completely worthwhile. The end result was fantastic and even I managed to preserve 3 small jars... honest, if you have the patience and the will or if you fear your wife...you will find that this jam is something else. I absolutely loved it. The limes were from Mexico (where else? ), the tomatoes were local, from the super famous Brian of West Vancouver (his fruits and veggies are nothing short of extraordinary), the coriander is from Guatemala -from my friend Esther-... sort of the perfect combo. I hope you enjoy this as much as I did. If not, you can always buy a factory made jam. 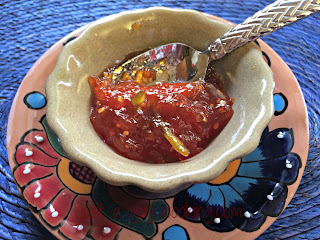 * The original recipe I found called for the tomatoes to be peeled and seeded, but I decided not to do so to preserve the pectin that the fruit naturally has. And…also it called for lemons instead of limes… but I like limes better than lemons. 1. Thinly peel 2 of the limes and slice the peel (julienne) in thin strips. Squeeze the lime juice of the 3 limes. 2. In a non-corrosive pan, place the tomatoes with the sugar, the lime rind and the lime juice and slowly bring it to a boil, mixing now and then so the lime-sugar covers the tomatoes. 3. Once it has boiled, reduce the heat to medium-high, keep mixing until the tomatoes break and their juices start to combine with the lime-sugar mix. Skim the foam that forms on top. 4. In about half an hour or so, the mix will be all blended (you might see some tomato chunks…just break them with the wooden spoon to incorporate). Bring the mix to a boil and incorporate the pectin and the juice of the remaining lime. Stir like crazy so all incorporates well. Add the coriander and mix until incorporated. 5. Using your candy thermometer we’ll watch the temperature so it reaches 105 ˚C , therefore we will continue stirring until the water evaporates (it takes me about an hour of stirring and watching to get the consistency of jam). 6. To know when the jam is ready I use the “wrinkle” test, that is, I put a saucer in the fridge to cool and when I think that my jam is ready, I pour a teaspoon of the jam on the saucer and run my finger through it…when the jam separates and stays separate….then I know that my jam is ready). 7. Pour the jam into a square glass mold (the ones we use to bake Lasagna) and allow it to cool overnight. The next morning it should have the perfect consistency, then proceed to ladle into the jars and seal. 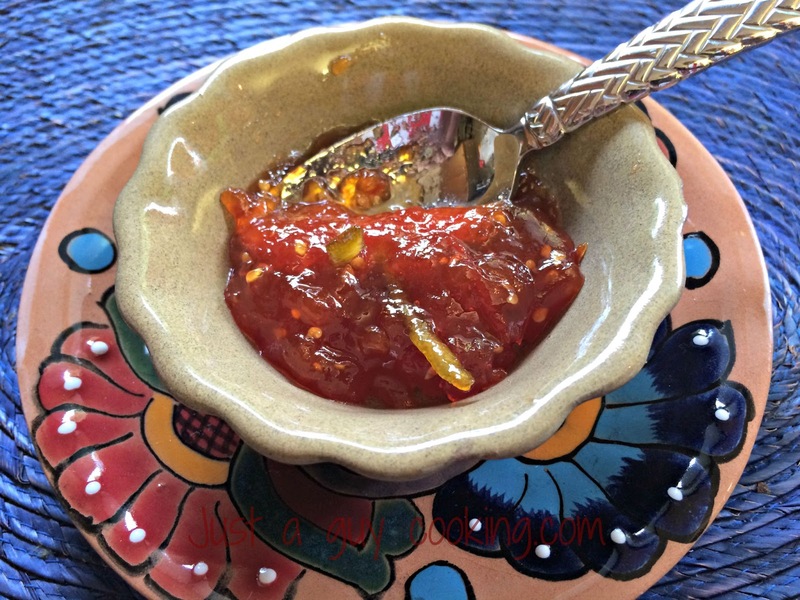 6.Enjoy!… This jam should have a shelf life of 2 years…but mine didn’t make the weekend.